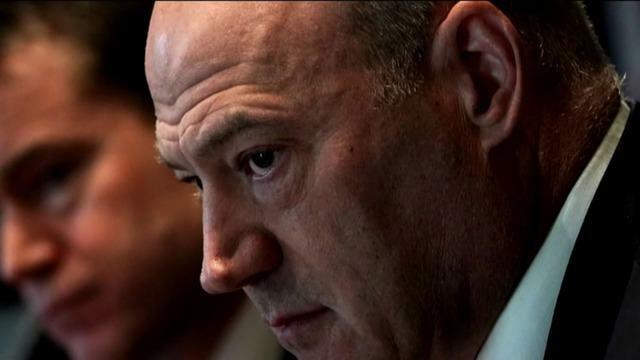 Top White House economic adviser Gary Cohn is resigning, after speculation that he might depart after a losing battle to keep President Trump from announcing new trade tariffs. Cohn had urged the president against imposing steep tariffs on steel and aluminum, which Mr. Trump announced last week. Gary Cohn answers question about future at White House: "I'm here today"
The news was first reported by The New York Times. Cohn's exact departure date is unclear. His resignation comes only a week after the announced departure of Hope Hicks, the president's trusted communications director. Earlier in the afternoon in a press conference with reporters and Sweden's prime minister, Mr. Trump dismissed the notion that the White House isn't an attractive place to work, saying everybody "wants a piece of that Oval Office." Mr. Trump called Cohn a "rare talent." "Gary has been my chief economic adviser and did a superb job in driving our agenda, helping to deliver historic tax cuts and reforms and unleashing the American economy once again," the president said in a statement. "He is a rare talent, and I thank him for his dedicated service to the American people." White House chief of staff John Kelly said: "Gary has served his country with great distinction, dedicating his skill and leadership to grow the U.S. economy and pass historic tax reform. I will miss having him as a partner in the White House, but he departs having made a real impact in the lives of the American people." Speculation over Cohn's tenure in the White House ramped up last week after Mr. Trump announced the 25 percent tariff on imported steel and 10 percent tariff on imported aluminum. Cohn was key in guiding tax reform efforts last year, as Mr. Trump and Cohn himself highlighted. "It has been an honor to serve my country and enact pro-growth economic policies to benefit the American people, in particular the passage of historic tax reform," Cohn said in a statement. "I am grateful to the president for giving me this opportunity and wish him and the administration great success in the future." But Cohn criticized the president's response to the Charlottesville violence last summer, nearly resigning over the matter.